We are currently running Instructor Course 13 with our client out in China. So we thought this would be a great opportunity to give you an insight into how a White Cap would spend a day on the course. We have a diary entry from KCTS consultant Paul Steven from Instructor Course 12, which happened last year. This diary entry gives you a look at how the Instructor Course works from a Trainers point of view. 05:30 : The day starts early, up and showered ready to arrive for breakfast. All the newsletters and notices have been printed for a flipchart in our hotel. 05:50 : The notices are updated for today’s activities and the newsletters are left on each team’s breakfast table. The newsletter shows the successes and has some fun about the activities of the previous day. 06:00 : A healthy but full breakfast to keep my energy running during the course activities. The Instructor Course is ran at full speed all the time. Some of the delegates are coming to breakfast early to start discussing their team’s activities. Others are working on their strategy to be 1st on the bus. 06:15 : The White Caps discuss the details of today’s activities over breakfast. Our White Team has 2 KCTS consultants and from 1 – 4 internal instructors. These internal instructors have passed the course previously and use the course again as way to improve their Change Agent abilities. They often feedback how surprised they are how much they learn from the course when taking a leading role. 06:30 : The White Caps split up. The KCTS consultants go to the factory to prepare the activities there. The internal instructors supervise the teams as they compete for 1st place on the bus. The position on the bus is used as a strategic competition. During the entire course a Team Game is running with points for displaying attributes of a Change Agent. 07:00 : Arrive at the factory and prepare for today’s activities. Check the preparations with the local team are in place and update our White Cap board with our daily KPI’s as discussed over breakfast. 07:30 : Teams arrive at factory and prepare for their presentations. 08:00 : Thought for the day. A KCTS Consultant explains how today’s activities fit within the overall course and reflects on the previous day. This allows the teams the space they need before their presentations and helps them maintain perspective. 08:15 : Learning Review & Team Presentations. During this session each individual on the course explains what they learnt the previous day. The White Caps record in detail their learning and assess whether they have demonstrated a learning through actions or whether they are only describing their ideas. Ideas are not assessed, they must demonstrate learning through their actions. Finally the team will demonstrate how they are progressing against the tasks they have been set previously. Points for the Team Game as awarded or removed based on their actions. Unfortunately, it has been known for teams to move into negative points. On one course a team was desperate to return to zero points. 09:00 : Daily activities start. On most days we have a lecture to explain the overall use of an improvement tool. Today we are working on a Major Kaizen. 09:45 : A Break for the teams. Tea, coffee, water, snacks & fruit are all available and breakfast seems a long time ago. There are over 32 people trying to refresh themselves so the operation has to be organised. Thankfully our factory has prepared well and our delegates are in good shape to continue. 10:00 : Today our lecture continues, some days they are out working at this point. Major Kaizen is a tool which allows a team to solve the majority of problems. Prior to using it the teams could have used simpler tools to exploit their experience. These tools having not reached a result because the system was not fully understood have moved onto Major Kaizen. The team need to understand their problem in detail both physically and based upon data. Armed with that knowledge they start to analyse how the system with the problem should function. The 32 delegates are working in 4 teams of 8 people. Within 3 days they will have tackled and corrected a Chronic problem which the host factory will have tried previously to solve. The benefit of the Kaizen depends on the problem. 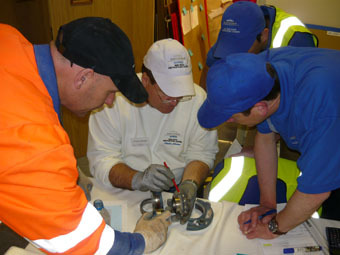 One of our teams is examining emissions, another is focused on machine set-up and another solving a logistics problem. The results from each Kaizen save the host factory thousands of pounds. 10:30 : The teams reform in Syndicate rooms. As a White Cap you visit each team to check on their progress. Do they understand the tool being applied? How is their team progressing with their daily activities? Is the Team Leader delegating and utilising all 7 of their people? How is each person’s learning? What concerns are they having in the use of the tool, the ability to get it to work in their factory or how they are to apply their Change Agent learning into their normal way of working? All these questions are tackled whilst focussing the team on delivering the Kaizen. 12:30 : A buffet lunch is available and all delegates make sure they have eaten. The pace of the course is fast and relentless, so energy is important. Most teams take food into their rooms and continue to work. We work with them, observing or coaching as needed. 13:00 : Out within the factory the problems are solved practically. The syndicate rooms form a base for operations but most work is done out on the factory floor. As the teams understand the problem and system they set their challenge. The challenge is how much of the problem can they eliminate. Once set they use 5 Why analysis to find the root cause. This must change a system or behaviour to be sure that the problem will not reoccur. 15:00 : Another break, and the possible causes are being debated. How can the teams verify them? How do they access the right people and what details are needed from the factory? 15:15 : The team starts to prepare for their daily presentation of results. The Kaizen work continues but all visualisation is reviewed and the presentation details are agreed by the team. Who will introduce the Kaizen, how will they demonstrate the problem, who can explain the system? 16:30 : All the teams present to each other as well as to the White Cap team. This presentation allows a formal assessment of the work completed but more importantly demonstrates the activity of Board Presentations which needs to be regularly used within factories. These presentations within working factories allow the team to explain their successes, gain recognition and ask for assistance with their leaders. A KCTS Consultant will feedback to the team. This is a detailed exercise on both the content of the Kaizen and the way the Board Presentation was conducted. It is important that each delegate leaves the Instructor Course with a role model on how to give constructive and motivational feedback. 18:00 : 2 Teams have presented and received feedback. Everyone need to recharge and keep their attention. 18:15 : Team presentations continue and all delegates need to be able to ask questions or comment if asked to do so. This ensures everyone is focused on the presentation not worried over their own work. 19:25 : The presentations are complete and the evening activities are outlined. The actions needed for tomorrow’s team presentation at 08:15 are reminded and the course closes for the day. 19:30 : The presentation area is returned to a lecture layout. All administration is updated and the room shut for the night. 20:00 : Arriving back at the hotel, a buffet is available and the teams are buzzing with discussion and questions. A curfew of 21:00 has been introduced to allow the teams to rest before the next day and all teams need to be reminded of this. 21:00 : End of the daily work and if possible we take a break. The newsletter and tomorrow’s activities should be ready for us to start again tomorrow at 06:00. This entry was posted on Tuesday, April 20th, 2010 at 14:37	and is filed under KCTS Resource, TPM. You can follow any responses to this entry through the RSS 2.0 feed. You can leave a response, or trackback from your own site.